In the past Month we’ve applied various new updates to Merch Titans, and have many more on the horizon! I haven’t produced much content lately, and plan on changing that. This blog post will kick-start my content creation, and I’ll be back on track providing you with useful insights, information, and guides on how you can improve your Merch by Amazon / Print on Demand sales and overall profits! In this post, I want to bring your awareness to our recent updates for Merch Titans, and let you in on some of our future plans for our members. Several Months ago we applied an update that made Merch Titans keyless, and we no longer require an Amazon Product Advertising API key from our users. You can simply signup for our software, and instantly have access to the entire suite of tools. No setup required. We’ve been consistently applying updates to our Product and Brand Search modules as these particular modules are at the heart of everything we do. We are continuously adding new categories to Product and Brand Search, and will continue to add more over time. As of now you can now run live searches for Merch by Amazon T-Shirts, Hoodies & Sweatshirts, PopSockets, and the NEWEST category – Create Space (books). We added a Create Space search feature inside Product Search. Now you can search for Create Space books on Amazon, and have the top selling books sorted for you, as well as show you monthly sales estimates, BSR average, total results, and much more. Historical Best Seller Rank and Price History data is coming soon to the Create Space category. We applied a HUGE update to Titans Vault this past week. This update is a game changer, and will really allow you to narrow in on specific categories and products in a manner of seconds by utilizing our unique set of filters. What categories did we add to Titans Vault? You can enjoy all the benefits of Titans Vault in a much more organized way, and with MANY more products and ideas at your fingertips! What are we doing to prepare for it? We’ve been hard at work implementing an option for you to search in either the www.Amazon.de, or www.Amazon.co.uk marketplaces. That way you can find product ideas, and keywords that are relevant to these particular marketplaces using the same membership, suite of tools, and interface that you’ve become accustomed to from Merch Titans. 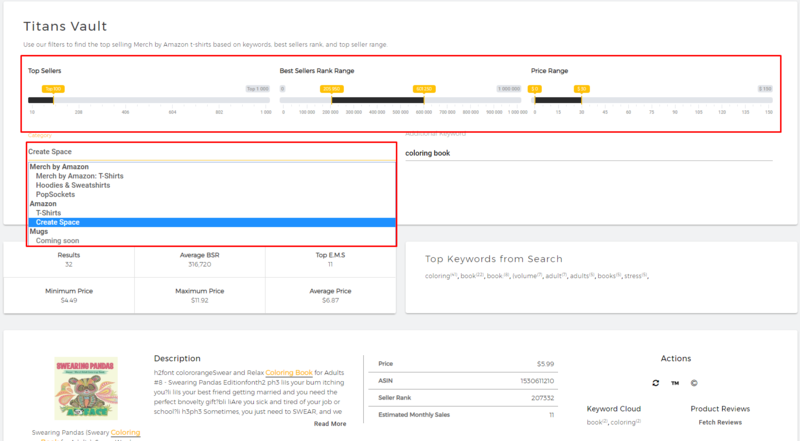 We’ve been wanting to improve our keyword research tool for some time now, and that’s our number one priority after we finish the Marketplace updates. The updates we have planned for the Keyword Research tool are much needed and will really give your keyword research a big boost and provide you with MUCH more data! Once this update is pushed you’ll have access to more keywords, more data, and more marketplaces. We previously returned 10 suggested keywords per search, and with our new update we’re going to increase the limit to 50 suggested keywords per search, and remove a lot of the previous limitations. We are adding Etsy as a marketplace to get “keyword suggestions” and data from. I know quite a few of our members use Etsy, and this will be a valuable and much needed addition to our keyword research tool. We’re still in BETA, but we are making huge improvements and pushing out continuous updates every week. We will continue to improve our tool/service, and conveniently provide you with everything you need in the Print on Demand space to save you time, improve your sales, and help you succeed faster! Merch Titans Beta Level 2/10 Unlocked. If you have any ideas or suggestions you would like to see added to Merch Titans feel free to let us know by commenting below. Great Blog Post and Very Informative! Thanks for all your hard work to make our lives much easier! I am looking forward to the updated current tools and the new tools to come! Good Work Guys! 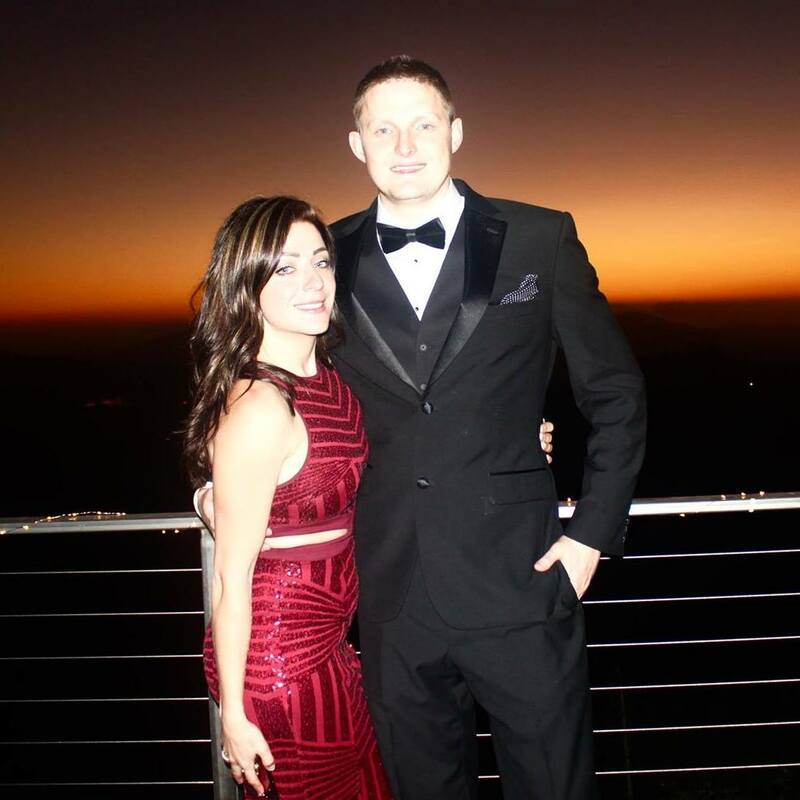 Hey Curtis, I am from Germany and if you need any kind of help about the realization of your tools for the german market of MBA feel free to contact me and I will help you. I have no idea about programming but sometimes you need a inspiration about a translation or about the german merket or what else ever…feel free to contact me. Greetings Sven & and enjoy your day. I appreciate that very much. I’m always looking for ideas/feedback/suggestions on how we can improve Merch Titans, and I’ll reach out to you when the time comes. Add a new comment in Merch Titans Updates: Product & Brand Search, Create Space, International Marketplaces, and Keyword Research article.